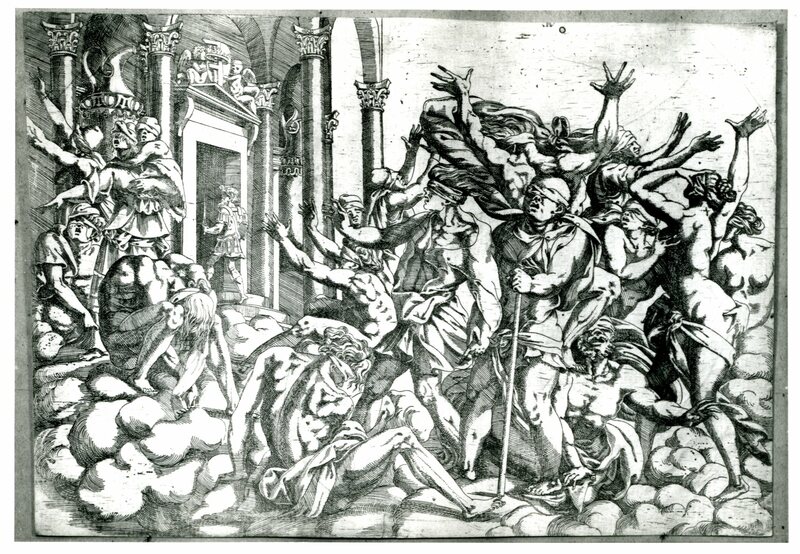 Etching by Antonio Fantuzzi, 30.9 x 42.8 S (Vienna). Heinecken, IV, 1790, 532, as Leon Daven after Rosso. Bartsch, XVI, 1818, 393, 43, as Anonymous, School of Fontainebleau, after Rosso. Robert-Dumesnil, VII, 1850, 24-25, under no. 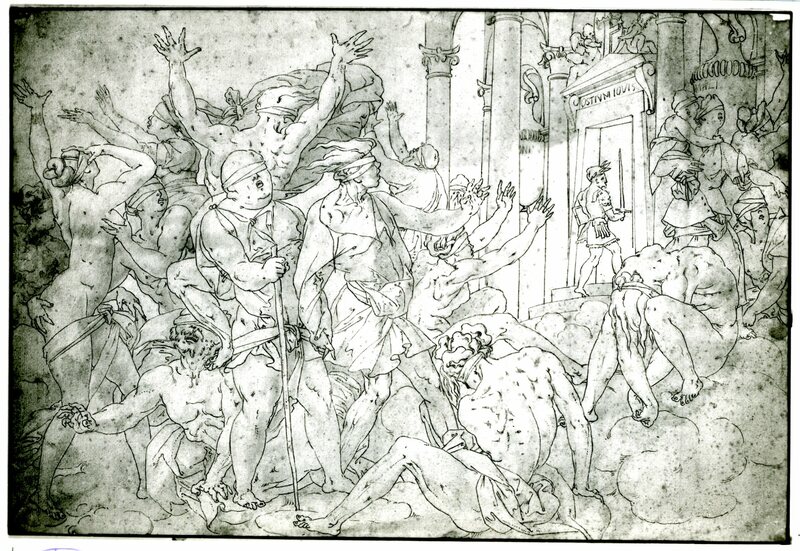 16, as Fantuzzi, specifies differences between this etching and Boyvin’s engraving of the same scene. Herbet, II, 1896, 278 (1969, 74), 28, as Fantuzzi. Zerner, 1969, A.F.24 (Paris), as 1542? COLLECTIONS: London, 1850-5-27-78. New York, 44.104.1; 66.658.7 (in red brown ink). Oxford (under Boyvin). Paris, Eb 14d (slightly damaged top center; stamped at lower right: D.3159). Vienna, H.B.IV, p.98, no. 106 (in red ink). Bocazzi, 1962, 63, no. 25, stating wrongly that Vasari gave the print to Boyvin. Zerner, 1964, 75, as datable in 1542. Oberhuber, 1966, 148, no. 237. Zerner, 1972, 113, Fig. 166. Béguin and Pressouyre, 1972, 137, as probably 1543. Zerner, IB, 33, 179, 319 (Vienna). K. Wilson-Chevalier, in Fontainebleau, 1985, 248-249, no. 194 (Private Collection). Carroll, 1987, 31, 45, 288-291, no. 92, with Fig. (Vienna). Davis, 1988, 225, under no. 100. Carroll, 1989, 26-27, Fig. 46 (Paris). Reed and Wallace, 1989, 23, under no. 15. 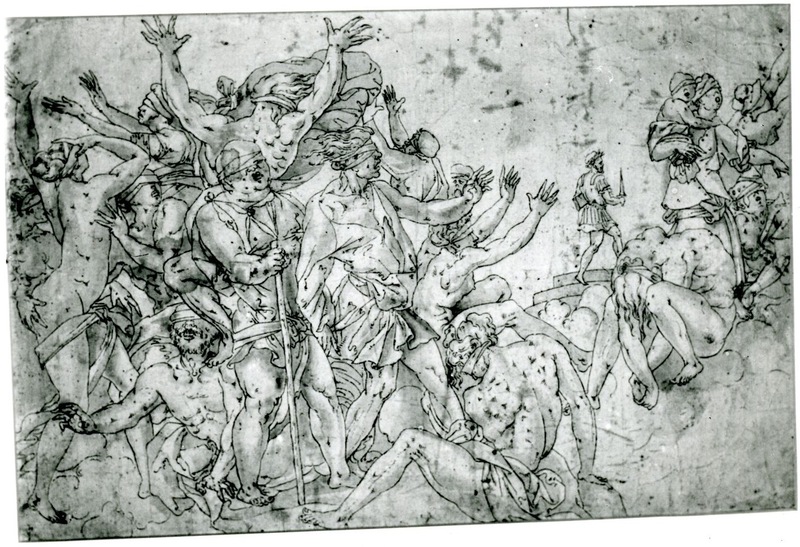 The etching is very closely related to a lost drawing by Rosso known from three copies (Fig.D.61A; Fig.D.61B; Fig.D.61C). Fantuzzi has slightly extended the scene at the top and includes the capitals of three columns that do not appear in the copies, or in Rosso’s fresco. The print also extends the image slightly at the left and slightly more is seen of the figures there. A small extension also appears at the bottom and at the right. The inscriptions on the urns above the door have been eliminated by Fantuzzi and the figure entering the door of the temple has been slightly changed. He has a longer beard, his cuirass has a band across the back, more flaps hanging from the waist, flaps over the upper arm instead of a lion’s head, and, by the addition of a few short lines, he is shown wearing boots; his sword is also shorter. These are the only significant differences from what appears in the copies of Rosso’s drawing. In Rosso’s fresco in the Gallery of Francis I (Fig.P.22, VII S a), this figure is exactly as he is in the drawings, except that he wears high-laced sandals. These, however, are not like the boots in Fantuzzi’s etching. Fantuzzi’s changes to this figure are probably merely incidental, resulting possibly from Fantuzzi’s wish to make the costume of the figure more complete and correct. Hence the flaps and the boots. 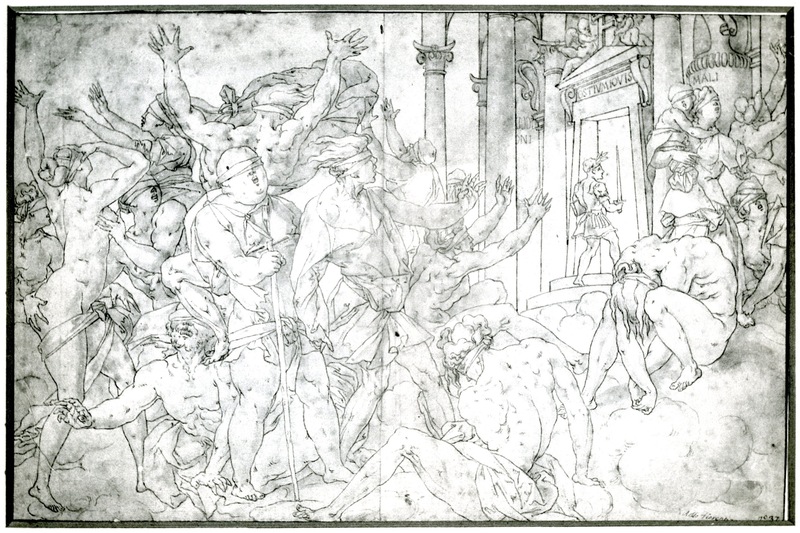 As in all other respects, except those specified above, the etching resembles the copies of Rosso’s lost drawing, which differs in certain details from the fresco, it is very likely that that lost drawing was the model that Fantuzzi used. The etching is in reverse of the drawings, and hence also of the painting, and is of approximately the same size as the drawings. But because Fantuzzi slightly expands the space of the scene, his figures appear slightly smaller. 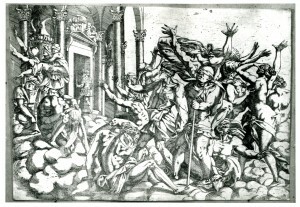 Although his etching technique gives a less compact aspect to the forms of the figures and makes the space between them less perceptible, the print gives every evidence of Fantuzzi’s intention to copy Rosso’s image faithfully. The most significant missing element is the effect of the light shining out from the doorway. 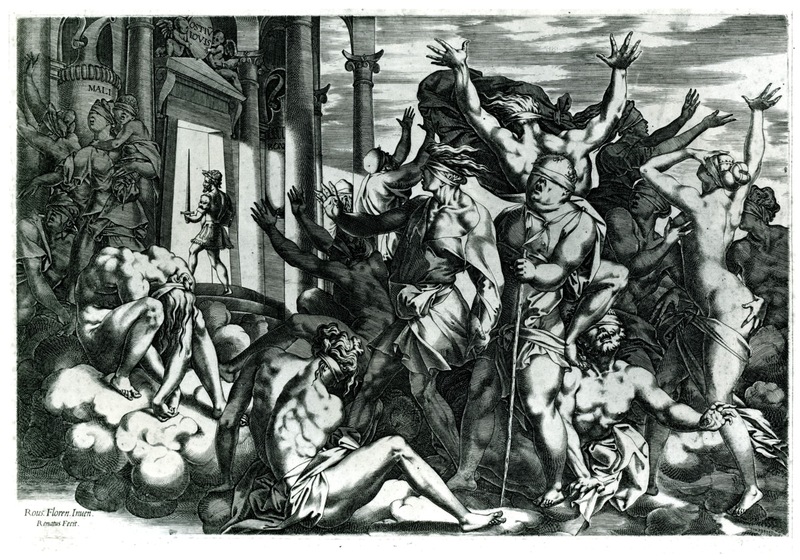 This is well reproduced in Boyvin’s engraving of the same scene (Fig.E.12), which more specifically copies Rosso’s lost drawing, although that print does not show the Royal F over the door that Fantuzzi preserves.